Be prepared to yell, scream, be shocked and stunned,and laugh ‘til it hurts. This tour is brand new and touring the World for the first time – it’s called ‘Nitro Circus Presents NEXT LEVEL’. The Next Level tour takes the ramp technology only previously seen at Nitro World Games and Travis Pastrana’s compound, and brings it on the road. This tour is literally too big for indoors, and can only be performed in outdoor stadiums because the guys are launching too high! Nitro Circus was launched in 2010 on the back of the global phenomenon that is the Nitro Circus TV Show – one of the most popular MTV series of all time. The Cirque Du Soleil of action sports entertainment. Nitro Circus is an entertainment offering as opposed to a competitive sports offering. The World’s best action sports athletes– including multiple X Games medal winners and stars. 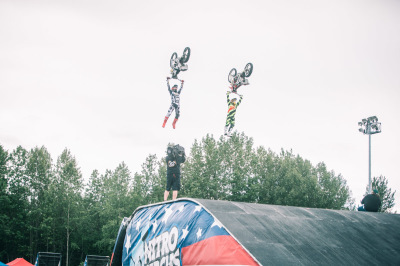 The show has spawned dozens of World Firsts that you literally cannot see anywhere else – including the FMX double backflip, BMX triple backflip, and ridiculous backflip variations on all the apparatus. Combines the World’s best with local athletes performing on the big stage. Outrageous motorized contraptions that shouldn’t be able to fly, being sent sky-high. If it’s got an engine, we’re going to try to jump it! Spectacular, death-defying, super-slick and riotously fun entertainment. The World’s most successful action sports touring act, selling approximately 3 million tickets in the last 7 years. 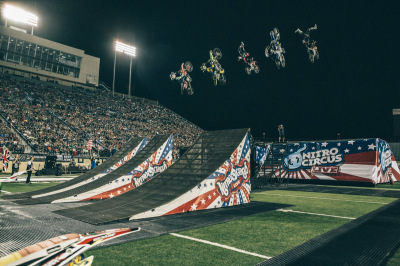 Nitro Circus Live will be returning to the US and Canada in June with a brand new tour. New VIP package that includes a track walk, signature poster, and autograph session with the riders.